tips & tricks for Bass fishing. Largemouth Bass are found in ponds, lakes, slow moving rivers and reservoirs. They seek weedy areas, lily pads and cover. Smallmouth Bass prefer clearer and cooler water. In streams and rivers, they are found in current break areas near moving water. Bass will strike at any time and are most active around dawn and dusk. Overcast days are best. In the spring, fish shallow areas during the day as the water warms. 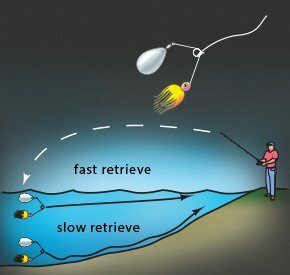 In the summer and fall, fish deeper or heavier cover areas during the day, moving shallower at dusk. Spinnerbaits are excellent. In the spring and summer, retrieve a spinnerbait so the blades are revolving just below the water surface. In the fall, retrieve the spinnerbait slowly, bouncing it off bottom obstructions. Bass also strike plastic worms, rigged grubs and many other artificial and live baits. Bass are attracted to lure movement, flash, and vibration. When fighting, Bass will jump out of the water to spit your bait. When you feel a Bass rising to the surface, drop your rod tip down towards the water to keep the fish down. Here are some popular approaches to Bass fishing. This rig is excellent for fishing in weeds and cover. Cast out and let it sink to the bottom. Hold your rod at the 10 o’clock position and slowly hop the bait along the bottom, pausing between hops. Run the line through the pointed end of the sinker. Tie the line to the worm hook. Push hook through center of the head of the worm and out through the side. Rotate hook & pass it through the worm so the tip of the barb is right beneath the surface of the worm. This is a versatile lure that can be used at all depths. It can be retrieved steadily or bounced off the bottom. Tie the line to the jighead. Push barb of jighead ¾-in through center of grub body. Push the barb through the top of the grub, opposite from the tail. Slide grub up the shaft until it meets the jighead. Retrieve rapidly, keeping spinner just below the surface of the water. Use a slow, steady retrieve, bouncing the spinnerbait off obstructions and cover near the bottom.